In the Ogre group on Facebook, Jeff Kelland shared photos of his custom terrain for use with the plastic Ogre miniatures that we've produced over the last year. Amazing work, Jeff! Please be sure to continue posting photos as your terrain project comes together. 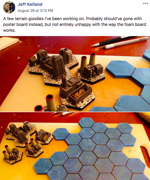 Those factory tiles are especially incredible, and it looks like you're on your way to constructing one Ogre board that everyone will want to borrow when you've finished.